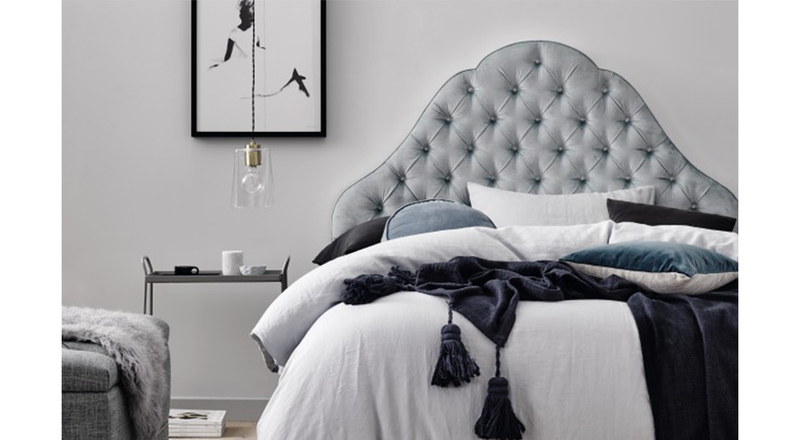 You may have noticed a few changes in beds and bedding in interiors of late, as interior design becomes increasingly relaxed, diverse and eclectic, writes The Block personality and Interior Designer, Carlene Duffy. With it, common thoughts on bedrooms, beds and how to style them is shifting, and all for the better in my opinion. I know, it’s crazy, right?! But believe me, it is perfectly acceptable to simply use an ensemble bed in your bedroom without a frame or bedhead because the key to a resolved bed/bedroom is really how you style around the bed. Art, for instance, can go a long way to acting as a bedhead if you don’t otherwise have one. It is about creating height and balance. 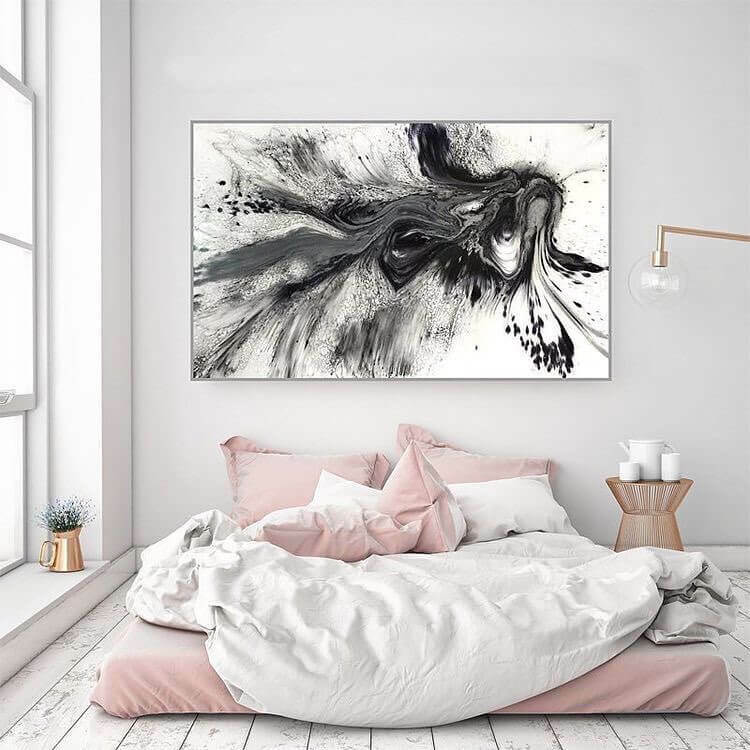 It can either be one large piece hung in the centre of the bed or a few pieces hung gallery style, either in the centre or off-centre. As an alternative to framed art, you may like to hang above your bed something a bit quirkier like a crotched wall hanging or an African Juju hat for a more of a relaxed look. Your bedside tables and lighting around the bed are also key to completing your look, whether you opt for an ensemble, a bed frame or a bedhead. Pendants that hang either side of the bed made a big bold push into bedroom design a few years back. And more recently, wall lights have become increasingly popular (wall lights/wall sconces once typically went hand in hand with a traditional interior aesthetic, which is no longer the case). 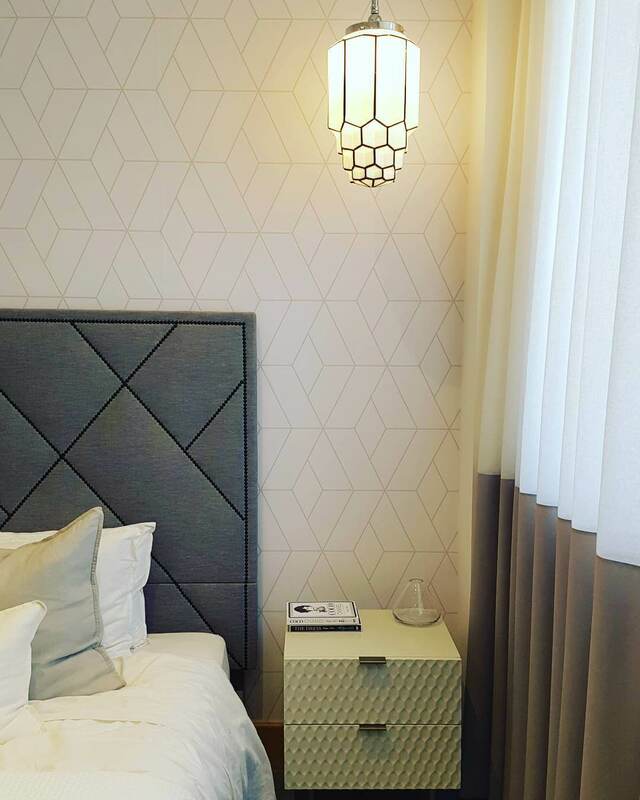 Whether you choose pendants or wall lights, how you style your bedside tables is important here. It needn’t be much but a vase, a jewellery bowl and a book or two goes a long way in making the bed and bedroom feel complete. If you opt for ye ole faithful table lamps as your choice of bedside lighting, I implore you to ensure that your lamps are proportionally suited to the size of your bed and bedroom. Because one of the most common problems that I see with bedside styling is undersized lamps that are dwarfed by the bed. With some exceptions, look for table lamps no less than 55cm high if pairing them with a Queen-sized or King-sized bed. Four poster beds were also once associated with classical/traditional interior schemes but hooray, here too, that rule has been thrown out the window (as is the case with many, once typically, classical looks). Contemporary timber and steel-framed four posters have really gained momentum in the past couple of years and not just in neutral colours but in a good range of bright and bold hues. The four poster works best in a space with higher than the standard 2.4m high ceilings where it can really work its magic. Generally, the four poster bed will be the hero of the space and it is good advice to keep it simple with the rest of the bedroom styling so that bed has its chance to shine. So for instance, keep your bedside table design fuss-free and possibly opt for a block colour quilt cover rather than a busy pattern. 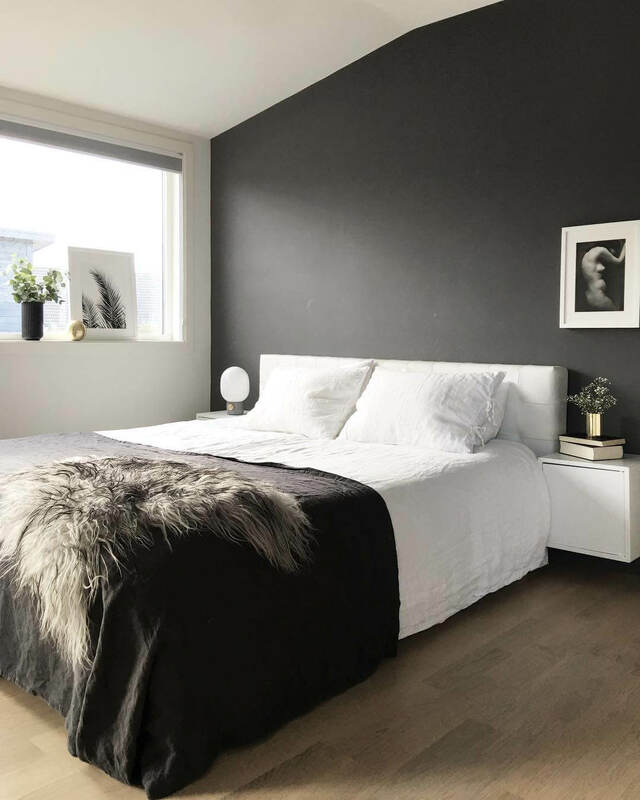 As we renovate our own house, I’m so torn between whether I want to keep it cool and calm with vertical timber paneling behind my bed, painted in a dark hue. Or if I want to go with a luxurious, tufted, velvet bedhead in emerald green or some wacky statement print. More now than ever, the world is your oyster when it comes to bedheads. But as you may know, when it comes to upholstery, it’s not cheap. So be discerning and choose wisely. If you love pattern, then, by all means, opt for a bold floral or stripe or polka dot or geometric covered bedhead. Better yet, embrace your inner Queen and go for a romantic empire-style bedhead covered in a rich velvet in a deep regal navy. However, if you are prone to becoming tired by your design choices quite quickly, it might be wiser to choose a good neutral coloured bedhead in a simple angular shape. Due to the costs associated with upholstery, it is not something you will want to be changing up frequently. But I do dare you to be wild. 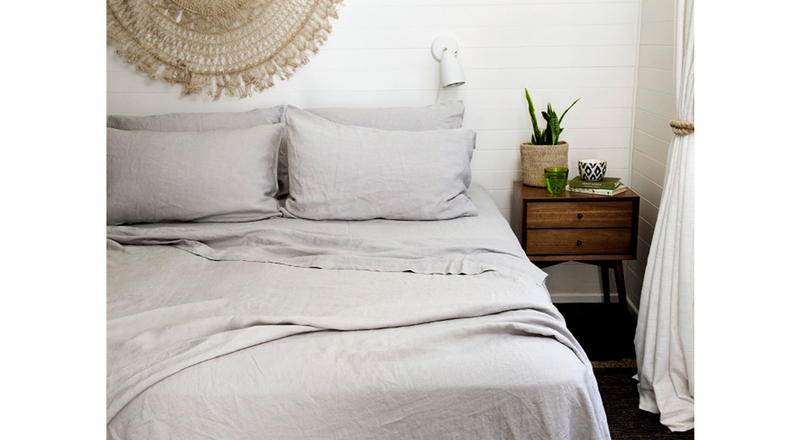 You would have to be sleeping under a rock to not have noticed that linen has made a big impact in interiors in the last few years and in the most glorious colours, at that. It has something to do with the fact that in the fast moving pace of interiors we are wanting materials that will stand the test of time, both as a trend and in terms of their durability. Linen is one such product. It is a natural fibre, which is synonymous with quality and I wouldn’t be the first person to tell you that quality lasts. The real treat is that, where linen was once only available in a small range of neutral colours, retailers are responding to market demand for richer, bolder colours that really make my heart sing. This one, your husband/boyfriend will love you for and that is the fact that where once, a perfectly styled bed meant dressing it with A LOT of pillows and cushions, a move towards a more minimalist style is often favourable. I, for one, have jumped on this bandwagon and it’s not because I don’t still love a full, layered bed but because as the demands of my life continues to pick up speed, I am looking for ways to simplify and streamline my routine. And if that means cutting back on how many throw cushions I have to throw on my bed each morning when I make it, so be it. I’m down to two standard pillows and two throw cushions but I’ve seen some very brave designers pair it all the way back to two standard pillows and nothing else. Less is more. Like in everything interiors, really understanding how to apply a look is best achieved by inundating yourself with design imagery for a clear understanding of context. Social media platforms such as Pinterest and Instagram are your best friend here so get busy scrolling and pinning. If you'd like to have a career in Interior Design and Decoration, read our Interior Design expert series, featuring interviews, tips and advice from Australia's leading Interior Designers here.